New Report: Is Your Company Making Self-Service A Priority? Want to know a paradigm that has always been false, but many people believe it? Organizations are battling each other to deliver the best customer experience for the right customer at the right time in the right channel. Customer service and customer engagement now play key roles in digital transformation strategy. However, leaders often stigmatize customer service or customer care as a cost center. This paradigm is false. Who created this paradigm should have their sanity checked. It makes no sense at all. Unless of course, a company is doing a poor job of customer service and customer experience. Savvy managers understand the value of great customer service and experiences. 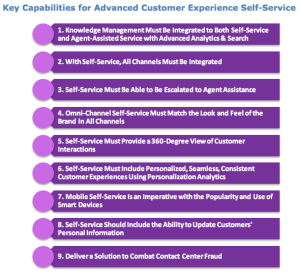 Top notch self- service is a key part of excellence in customer experience. New channels such as text and social media have now surpassed the phone for the first time in history, showing how channels to the customer must be ubiquitous. • Reducing risks, fraud and mistakes and improving compliance. For more information about this report, you can find it here.